Pamela J. 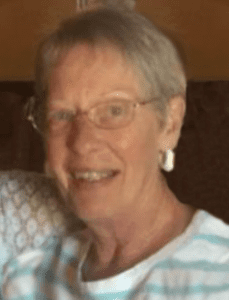 Rose, 70, of West Bend, Wisconsin, lost her battle with cancer and died on Sunday, Feb. 3, 2019, at Kathy Hospice with her family at her side. She was born on May 21, 1948, in Gettysburg, South Dakota, the daughter of the late David (Ted) Stroup and Verna Maxine Frazier. She attended schools in Gettysburg and Aberdeen, graduating from Aberdeen in 1966. Pam was a very active person. She worked her entire life. She found great joy in managing apartment buildings for seniors. Pam loved spending time with her family. She was very active in the lives of her grandchildren. She went to their sporting events, took them fishing, out to eat and babysat for them. Her faith was very important to her. She was extremely active in her church. She enjoyed going to the Y for swimming classes. Crocheting had always been a passion of hers. She crocheted everything from blankets, to hats, to holiday decorations. She also loved going home to Gettysburg, SD. She made the trip every summer to see her brothers. She had a great passion for helping others. Those Pam leaves behind to cherish her memory include three children, Michelle (Todd) Thomas, Suzanne Rose – both of West Bend – and Donnie (Courtney) Rose of Waupun; grandma to Ashley, Steven and Jessica Thomas, Gage and Gavin Welch and Greyson Rose; two brothers, Calvin Stroup of Lompac, CA and David Stroup of Gettysburg, SD; and other family members and friends. In addition to her parents, Pam is preceded in death by her sister, Sharon Sheldon and her brother, Deane Stroup. A private service was held at St. James Episcopal Church in West Bend. The family would like to extend their appreciation towards Mother Mindy of St. James Episcopal Church, Betty Kendgia, Frank and Sandy Aliota. Family would also like to thank the staff at Kathy Hospice, offering a special thanks to Jodi and Maryann for their loving care and attention to Pam. The Myrhum Patten Miller & Kietzer Funeral Homes have been entrusted with Pam’s arrangements. Additional information and guest book may be found at www.myrhum-patten.com.